Bauxite is a naturally occurring form of aluminum ore. It consists of 45-60% aluminum oxide, 12-30% water, and various other impurities. Bauxite is typically mined in open-pits and either processed into alumina near the mining operation, or shipped to smelting markets around the world for processing. Less than 1% of aluminum in the U.S. comes from domestic bauxite. 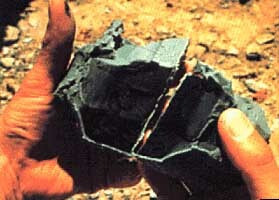 Major bauxite producing countries include Australia, Guinea, Brazil, Jamaica, and the former U.S.S.R.